Saturday we had perfect weather for the largest ever turnout for an Oakland Urban Paths walk. There were 70+ people and at least 6 dogs who joined us to explore Oakmore Highlands and Sausal Creek. We started by crossing the Leimert Bridge. It was built in 1926 by developers Harry and Walter Leimert so they could develop Oakmore Highlands. It originally had Key System streetcars running over it as well as cars and pedestrians. In 1947 the poles used for supporting the streetcar power lines were converted to street lighting. The 117-foot high concrete arch bridge was designed by engineer George Posey, who also designed the tube to Alameda. Back across the bridge, we headed up the Bridgeview Path stairs. The stairs were built when the original development was, but had fallen into disrepair. After some resistance from the city, they finally agreed to fix them up, with the proviso that the homeowners keep them clean. In 2005 there was a ribbon-cutting ceremony for the reopening of the stairs. Compared with many stairs around Oakland, these ones are now in great shape, with repaired concrete and new railings. We walked up and down more stairways, and I pointed out the WPA stamps in one set that date them to 1939. I also pointed out some sidewalk stamps, and mentioned Andrew Alden‘s method of estimating the age of a neighborhood. Up several streets, passing lots of beautiful homes and some lovely views, we made it to the high point of our journey. The house there is marked by a mailbox labeled “Hilltop House”. We even saw a red-tailed hawk soaring overhead. Past more houses (including that of Mayor Jean Quan) we came to a dirt path at the end of a cul-de-sac. That led us to some wooden stairs, which led us to the back of the Mormon Temple property. Before touring the grounds, we talked a bit about the temple. 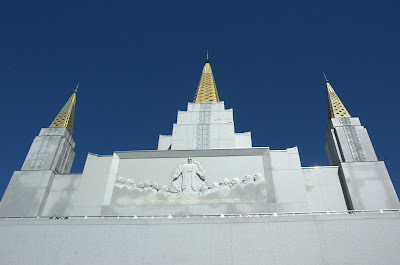 The temple was built in 1964, and a NY Times article a few years ago said it has an approximately $35,000 per month electric bill. If you’ve ever seen the temple at night, it’s not hard to see why—the brightly-lit temple is visible from all over the Bay Area at night. One of our walkers who lives not far away related two things: (1) the light from the temple is bright enough to light up her house (2) back during the rolling brownouts, the temple complied with requests to power down to ease the demand on the electrical grid. The FAA quickly requested they turn the lights back on, because the temple is used as a landmark for pilots flying under visual flight rules (VFR). We walked across the immaculately maintained grounds, and then to the base of the temple to take in the views. Then we headed to Monterey Blvd. which parallels highway 13. A short, unexpected tunnel led us under the freeway to the corner of Joaquin Miller Park, and the former site of Camp Dimond. It was a Boy Scout camp from 1919 until 1948, and along with cabins and other permanent structures, it featured a 300,000 gallon pool with a special sand filtration system. We headed back under the freeway and down to the trail head for the Bridgeview Trail. There, volunteers with Friends of Sausal Creek were finishing up a morning of working to restore and protect the watershed. The trail descends to the creek and back up the other side of the canyon, then is relatively flat, running almost down to the bridge where we’d started. But it was quite a change from the streets and stairs we’d been on up to that point. Thanks to everyone and everywoof who came out for the walk. I hope you had as much fun on the walk as I did leading it! Special thanks to area resident John Tuttle who told us about the history of the Leimert Bridge and Oakmore Highlands, and to Megan from Friends of Sausal Creek who told us about the work that FOSC does to restore and protect the watershed. The next Oakland Urban Paths walk will be Saturday, April 13th. We’ll be exploring Oakland’s parklets.